They call HDL “good cholesterol.” But it’s better than that. HDL keeps arteries young. The more HDL you have, the better. But how do you get your HDL level up? HDL is especially important when you have diabetes. A new Italian study followed more than 47,000 people with Type 2 for four years. Those with low levels of HDL had a 44% increased chance of developing signs of diabetic kidney disease. Low HDL levels were more dangerous than high levels of triglycerides, which were thought to be a greater risk. HDL stands for “high-density lipoprotein.” Our bodies have two main types of cholesterol carriers. Low-density lipoprotein (LDL) takes cholesterol from the liver to the rest of the body. LDL leaves a lot of extra cholesterol lying around, where it can form hard stuff called “plaque” in arteries. HDL goes the other way. It brings extra cholesterol from other parts of the body back to the liver. It keeps plaque from forming and helps keep arteries open. It undoes damage that life, food, and time do to arteries. Your HDL level means a lot for your risk of stroke, heart disease, kidney disease, and other kinds of blood vessel damage. Since diabetes complications result from blood vessel damage, you really want your HDL level up. A level over 60 mg/dl (milligrams per deciliter, the same measurement used for blood sugar) is considered excellent. From 40 to 60 is OK. Below 40 is considered low. 1. Exercise. Aerobic exercise for 120–180 minutes a week raises HDL. Some studies have found that lower-extremity exercise such as bicycling and strength training is good for HDL. 2. Stop smoking. Many studies show HDL goes up in people who stop smoking, even though their weight tends to increase. 4. Increase fiber. Eat more vegetables, fiber-rich fruits like apples and berries, whole grains (but not too much carbohydrate), and fiber supplements. 5. Eat purple and red things. Pigments called anthocyanins give foods their purple and red color. They also boost HDL level. According to the website Everyday Health, good purple foods include grapes, eggplant, purple cabbage, plums, and raspberries. Prevention magazine says cranberry juice (unsweetened or stevia-sweetened) is a great purple food. 6. Treat yourself to 1.5 ounces of dark chocolate a day. Not at night, as it might keep you awake. 7. Don’t eat pure sugar. A large study in The Journal of the American Medical Association found that the more added sugar people ate, the lower their HDL levels tended to be. 8. Get the right kind of fat. Olive oil is great. So are fatty fish. Most vegetable oils tend to raise HDL, while saturated (meat) fats and artificial (trans) fats tend to lower it. You might consider eating a vegetarian diet as often as you can, but don’t go low fat and cut out the good oils. 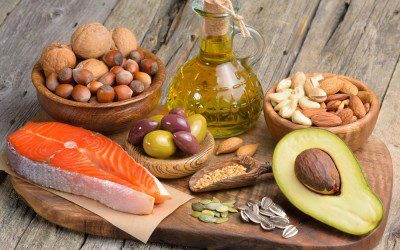 According to the University of California’s Berkeley Wellness site, too little fat and oil lowers HDL, a big mistake. 9. Eat other good things for HDL. This includes flax- and chia seeds, nuts, avocado, soy, beans and other legumes, and the supplements folate and niacin. Sleep apnea can contribute to worsening blood sugar control, high blood pressure, and more. Bookmark DiabetesSelfManagement.com and tune in tomorrow to learn how it can be diagnosed and treated.